The mass surrendering of Mali-based Algerian fighters, as well as militants in southern Algeria, is increasingly driving a wedge between al-Qaeda and the Islamic Maghreb (AQIM) in Algeria and Jamaat Nusrat al-Islam waal Muslimeen (JNIM) in Mali, which may force the groups to shift from regional operations to a more local focus. 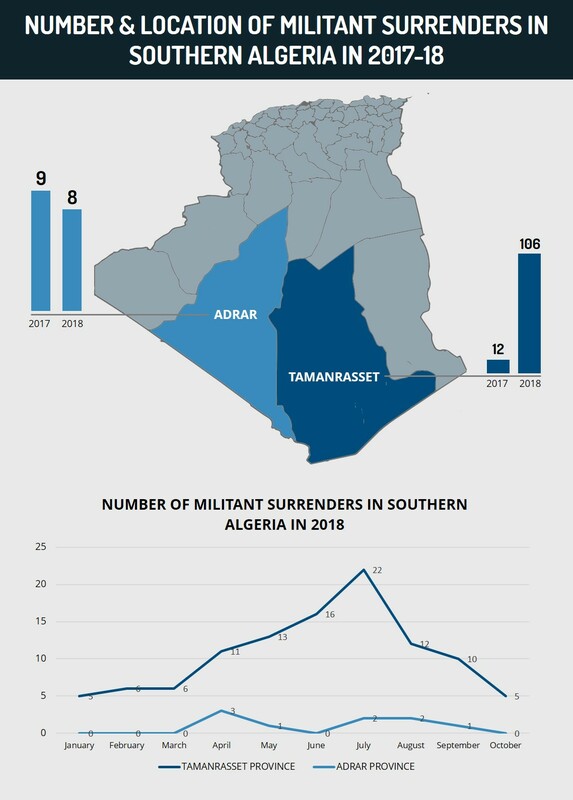 So far in 2018, 120 militants have surrendered to Algerian security forces compared to 28 in 2017, and most of them are likely a part of the AQIM contingent in southern Algeria and northern Mali. Despite this trend, and the reduction in their propaganda, the Mali-based al-Qaeda coalition JNIM, were able to maintain, and in some cases improve, their scope and scale of operations in 2018. While groups in Mali may seek to use Niger as an substitute option for logistical purposes, should these trends persist and no effective alternatives be utilized, it will inevitably have an adverse effect on AQIM and JNIM’s operational capabilities in the coming months and years. So far in 2018, 120 militants have surrendered in Algeria to the People’s National Army (ANP), compared to a total of 28 militants in 2017. Moreover, in 2018, 114 out of the 120 who surrendered did so in Adrar and Tamanrasset provinces, located just north of Algeria’s border with Mali and Niger, while in 2017, 21 out of the 28 militants who surrendered did so in Adrar and Tamanrasset provinces. Additionally, according to reports from May, Algeria expelled 105 Malians on charges of links to Ansar Dine, a Jamaat Nusrat al-Islam waal Muslimeen (JNIM) constituent group. According to Algerian authorities, it was facing an influx of illegal migrants from Mali and Niger into its southern border provinces. 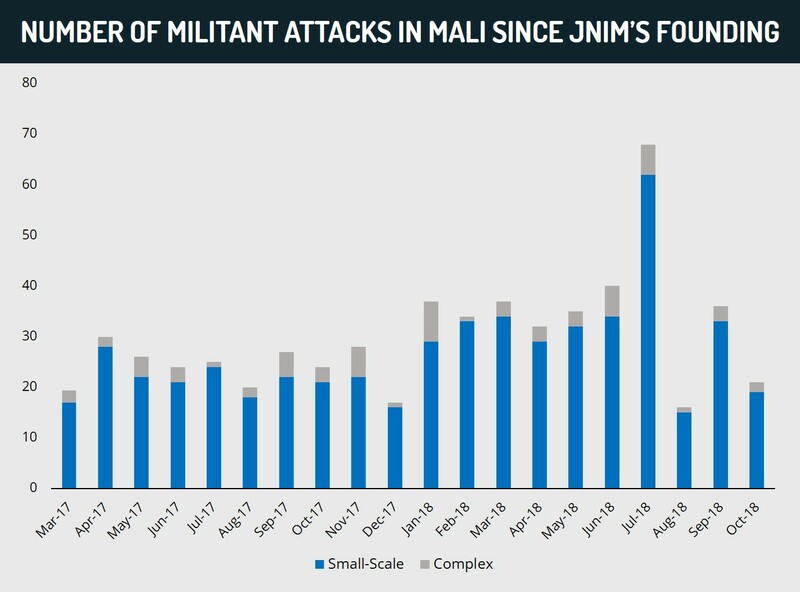 However, in Mali, JNIM has consistently carried out about 35 attacks per month in 2018 thus far, an increase from 2017, which saw approximately 25 attacks per month following the coalition’s founding in March. The primary exception was in July 2018, when JNIM increased its activity in efforts to undermine the presidential elections. As a whole, the majority of JNIM’s attacks are smaller-scale, though they have conducted at least 36 complex attacks in 2018. AQIM’s roots can be traced back to the Salafist Group for Preachment and Combatant (GSPC), an offshoot of the Armed Islamic Group (GIA), which fought in the Algerian civil war of the 1990s. In 2006-7, the GSPC distanced itself from the GIA, largely due to the fact that the GIA had lost much of its local support due to indiscriminate killings, and aligned itself with al-Qaeda. As al-Qaeda’s strongest affiliate in Africa at the time, AQIM in Algeria supported jihadist efforts in other parts of the Maghreb, including in Mali. However, intensive counter-militancy campaigns by the ANP, which involved the use of airstrikes as well as ground raids, gradually reduced the power and influence of AQIM in Algeria, and drove some if its fighters and assets into northern Mali. In March 2017 in Mali, AQIM’s Sahara branch, al-Mourabitoun, Ansar Dine, and Macina Liberation Front announced that they would be unifying under a single al-Qaeda coalition, JNIM. Although the individual groups have continued to act within their general spheres of influence in the northern and central regions, JNIM has presented a united front for its strategic and militant operations in Mali. This completed a shifting of AQIM’s center of gravity from Algeria to Mali, with JNIM now the strongest and most potent al-Qaeda group in the region and Algeria serving mostly an auxiliary effort. However, this move was likely only reluctantly accepted by AQIM in Algeria, whose Emir, Abdelmalek Droukdel (also known as Abu Musab Abdel Wadoud), an important figure within al-Qaeda’s hierarchy, seeks to restore the lost prestige of the organization. The ANP’s counter-militancy campaign has been largely successful in dislodging the threat of militancy in Algeria, as highlighted by the lack of a large-scale militant attack on Algerian soil in at least two years. The success of this campaign can be attributed to its focus on four key variables: the militant group’s ranks, support base, infrastructure, and supply lines. First, by targeting fighters, the ANP has significantly diminished the ranks of AQIM in both northern and southern Algeria. Second, at the same time, the security apparatus has attempted to dismantle the local support base of militants in these regions in order to deprive them of the ability to evade security operations. This is in light of the fact that a local support base, which is sustained due to a high rate of radicalization among youth residing in outlying areas of Algeria, provides militants with a pool of potential recruits as well as logistical support, likely in the form of safehouses, supplies, and information on security forces’ movements. Third, this counter-militancy campaign has resulted in the large-scale dismantling of militant infrastructure, which includes hideouts and weapons caches located in the mountainous parts of northern Algeria. Finally, Algeria has tightened its security along its porous borders with Mali, Niger, Tunisia, and Libya. This includes increased checkpoints as well as patrols along these borders in order to prevent the cross-border smuggling of fighters, weapons, and supplies into the country. Over recent months, the majority of AQIM’s activity has become restricted to areas along the Tunisian border, such as Tebessa and Khenchela provinces, as this region allows the militant group to coordinate with its affiliate in western Tunisia. Therefore, in response, the Algerian security apparatus increased its intelligence sharing and cooperation with the Tunisian security apparatus in order to combat this threat of cross-border militancy. This strategy has been particularly successful for both sides, as demonstrated by several instances in which the ANP has successfully neutralized militants who escaped the jurisdiction of the Tunisian military by crossing the border into Algeria. Aside from this, the ANP has been very successful in dismantling the senior local leadership of AQIM since the beginning of 2018. According to the Algerian Ministry of Defense, the ANP arrested two senior AQIM leaders in Skikda Province in July, and killed eight senior AQIM leaders in counter-militancy operations in Jijel Province in February. These factors have likely had a significant adverse impact on the Sunni jihadist groups’ prestige in Algeria. This, in turn, is liable to have impacted the morale of their fighters in the country, who have may have become disillusioned. Taking all these factors into consideration and combining them with reports of an “amnesty deal” put in place by Algeria, France, and Mali, may give a plausible explanation for the large-scale surrenders of militants to the authorities in Tamanrasset Province since the beginning of January 2018. The timing of this amnesty agreement, when conjoined with the low morale of ground fighters, would provide for the required incentive needed for militants to voluntarily surrender to authorities. In light of southern Algeria’s porous borders with northern Mali, it is highly possible that militants who have managed to infiltrate from Mali into Algeria are capitalizing on Algerian authorities’ reintegration policies to leave AQIM. While several of these militants have been of Malian nationality, the majority of them are Algerians who were fighting for JNIM in Mali, indicating that the amnesty deal only applies for militants of Algerian nationality. This is further underscored by Algeria’s decision to extradite 105 Malian nationals suspected of belonging to JNIM’s Ansar Dine. FORECAST: Therefore, this ongoing trend of Mali-based militants attempting to surrender to the ANP in southern Algeria will likely continue over the coming months. The majority of these militants will likely be of Algerian nationality as they attempt to return to the country to seek advantage of the reported “amnesty deal”. FORECAST: However, AQIM leadership continues to be interested in maintaining an operational base in Algeria, likely due to the country’s historical and symbolic significance to the group. This has been demonstrated by an uptick in militant attacks conducted by the group in Algeria over recent months. As the group’s leader, Abdelmalek Droukdel, is likely still alive, he will attempt to keep the group active for as long as possible. Therefore, the coming months may see an increase in militant attacks in Algeria. These will be focused in areas that have been considered relatively secure and witness lower security protocols. However, militant groups in the country likely do not possess the necessary capabilities to mount a large-scale attack at this time and such attacks will likely utilize low sophistication IEDs or ambushes. Since its founding, JNIM has exhibited a strong media strategy, frequently publishing claims of responsibility for attacks in Mali and Burkina Faso that detail the incidents and their locations as well as releasing sophisticated video propaganda. However, a downtick in publications since mid-2018 has created the perception that JNIM’s activity itself may have also declined. This perception was heightened as it came alongside reports of the amnesty deal in Algeria, as well as a series of French “decapitation” airstrikes that targeted JNIM leaders and positions in northern Mali’s Timbuktu and Mopti regions. However, despite these factors, as demonstrated, JNIM has remained as active as ever in its main theater of operations in northern and central Mali. In contrast, the group has conducted approximately ten more attacks per month in 2018 than they were able to do in 2017, suggesting that any loss of fighters has not been detrimental to their operations. The numbers indicate that, since their emergence in March 2017, JNIM has conducted about 600 attacks in Mali, including at least 355 in 2018 alone. The vast majority of these attacks are small-scale, including tactics such as emplacing IEDs, shootings, and simple ambushes. These have enabled the militants to target and undermine security forces across a wide geographical area and reinforce their presence. At the same time, JNIM has also been able to carry out complex and large-scale attacks at least once a month, generally against high-profile targets such as airports or military camps. A multi-pronged attack against a French-UN base at the Timbuktu Airport in April 2018 highlights their offensive capabilities, as it involved at least three suicide vehicle-borne IEDs (SVBIEDs) disguised as UN and Malian army vehicles entering the base and detonating, as well as exchanges of rocket and small-arms fire. This exemplifies their persistent ability to exploit security forces’ vulnerabilities and marshal the necessary manpower and firepower to conduct sophisticated attacks against even fortified targets. To this point, it appears that the surrender of Algerian militants has had little to no direct impact on JNIM or the overall security landscape in Mali. Although AQIM originated in Algeria, the base of the organization’s power has clearly shifted to Mali. With the exception of Yahya Abu Hammam, the emir of AQIM’s Sahara branch, JNIM’s top leadership is Malian, with the Tuareg Malian Iyad Ag Ghaly at the head of the group. It is possible that the departure of any Algerian jihadists has had little impact due to a successful transfer of knowledge in terms of weapons or capabilities to the Malian organizations over the years. Moreover, as al-Qaeda groups expanded into Mali from Algeria, they entrenched themselves in local communities and built recruitment networks that are based in local ethnic dynamics, with Tuaregs and Fulanis in particular representing a significant constituency for JNIM’s component groups. These populations would then mitigate the loss of any Algerian jihadists. 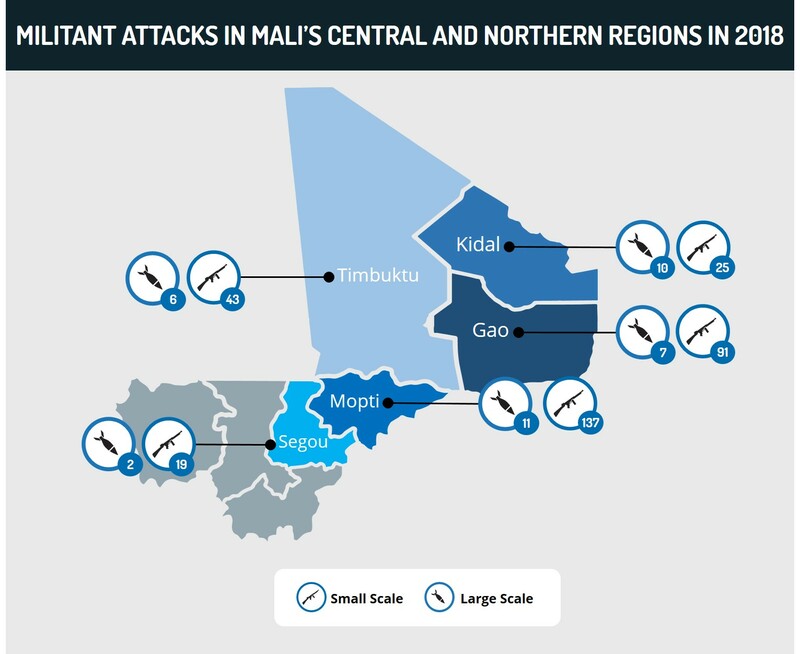 FORECAST: Given these trends and the difficulty that domestic and international armed forces have had in degrading JNIM, there is little to indicate that the pace and scale of attacks in northern and central Mali will be reduced in the immediate term. The group continues to retain the knowledge, resources, and capabilities to be a significant threat in their area of operations in Mali as well as the tri-border region with Burkina Faso and Niger. Their activity is likely to persist along the same lines, largely as small-scale, low-capability attacks against security forces, while larger, more complex assaults against high-profile targets will occur intermittently. As noted, the unprecedented uptick in Algerian militants crossing the border from Mali in order to surrender to the ANP appears to confirm the reports of an amnesty deal. Moreover, the effect is almost exclusively restricted to southern Algeria, with only 6 of the 120 militants who surrendered having done so in northern Algeria, indicating that most of the militants who turned themselves in were part of AQIM’s contingents in southern Algeria and northern Mali. While the impetus is clearly the low morale of the fighters, the reason why this is only affecting Algerian fighters in southern Algeria and northern Mali and not the ones in northern Algeria remains unclear. Reasons can range from a rift between the Algerian “foreigners” and the local fighters in Mali over prestige to objectives of the militancy campaign to Algerian fighters simply becoming disillusioned and exhausted after many years of fighting abroad. FORECAST: While the reasons remain speculative, the ramifications are clear, namely the deteriorating ability of AQIM in Algeria and JNIM in Mali to cooperate, which may in turn lead to an effective split between the groups. This process is driven by the changing dynamic on the ground rather than a shift in strategy by al-Qaeda. Depleting number of Algerians in Mali means that there are fewer people who can serve as liaisons between AQIM and JNIM, and fewer people who can exploit their naturally better knowledge of Algeria to physically assist in cross-border activities. This is aggravated by the dwindling number of AQIM militants operating in southern Algeria due to the surrenders, which adds a geographical dimension to the distancing of the groups. FORECAST: This would lead to more difficulties in the physical transfer of weapons, recruits, and supplies, as well as the exchange of knowledge and information. Some of these losses can be compensated for by al-Qaeda. For example, AQIM in Algeria has increased its interaction and cooperation with its affiliate in Tunisia, Okba Ibn Nafaa Brigade (OIB), and a persistent presence of al-Qaeda elements in southern Libya can also serve as a mitigating factor to the reduced interaction between Algeria and Mali. Nonetheless, they cannot fully replace the critical Algeria-Mali link, simply because of the distance, which would overstretch some elements of al-Qaeda’s supply lines from the Mediterranean coast into the Sahel. These can therefore not fully compensate for the wedge being driven between AQIM in Algeria and JNIM in Mali. FORECAST: Overall, this means that the prospects for cross-border militant activity in cooperation between AQIM and JNIM has likely significantly dwindled and will continue along those lines in the coming months, forcing both groups to assume a much more local approach instead of being a part of a regional effort. Those in Mali may attempt to replace the use of southern Algeria with an alternative, such as using Mauritania and Niger for the movement of weapons, supplies, and manpower. In this regard, northern Niger is a more likely option for logistical purposes, as it would provide Mali-based groups with potential direct routes to Libya, whereas Mauritania would be a more roundabout and difficult approach. However, should the trends in Algeria persist, with no effective alternatives being utilized, it will inevitably have negative implications for both groups’ operational capabilities. Travel to Algiers and Oran may continue while adhering to all security precautions regarding militancy and civil unrest. Consult with us for itinerary-based travel recommendations. Avoid nonessential travel to Kabylie, due to the heightened threat of militant attacks and general unrest in the region. Those conducting business essential travel to the region are advised to avoid the mountains between Tizi Ouzou, Bouira and Saharidj due to the heightened militant presence and activities in this area. We advise against all nonessential travel to Algeria’s outlying areas. For business-essential visits, consult with us for itinerary-based travel recommendations and ground support options. In Algiers and other major cities, remain vigilant in the vicinities of public squares, government buildings, and police stations, as these serve as focal points for protests and militant attacks. Travel to Bamako may continue time while adhering to stringent security precautions regarding criminal activity and potential militancy. We advise against all travel to northern and central Mali, as well as its border regions with Niger and Burkina Faso, given the threat from militant and rebel groups operating in the area, as well as ongoing ethnic tensions. Why is the United States cementing its support for Algeria, who just so happens to be a staunch ally of the Assad regime while cozying up to Iran? 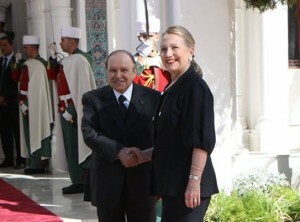 It’s a consideration US Secretary of State Hillary Clinton likely had in the back of her mind during her latest talks in Algeria this week, the only North Africa stop on her way to the Balkans. While Algeria has remained little more than a blip on the international media’s radar, its strategic importance has skyrocketed in the wake of the Arab Spring. After the fall of secular dictators across North Africa, the military-backed Abdelaziz Bouteflika regime has emerged as the last dependable ally in the war on terror in an age where the US needs all the friends it can get. Hey Buddy!, I found this information for you: "Strategic Analysis: Algeria’s Growing Role in the War on Terror". Here is the website link: https://www.max-security.com/reports/strategic-analysis-algerias-growing-role-in-the-war-on-terror/. Thank you.